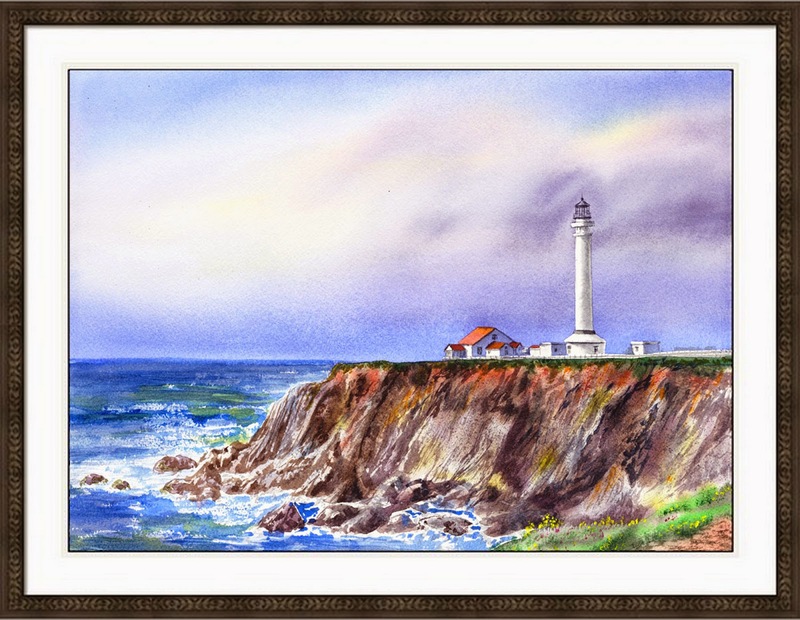 The Point Arena Lighthouse is situated on the closest point of land to the Hawaiian Islands in the Continental United States. The point is surrounded on three sides by the Pacific Ocean which keeps the area cool. 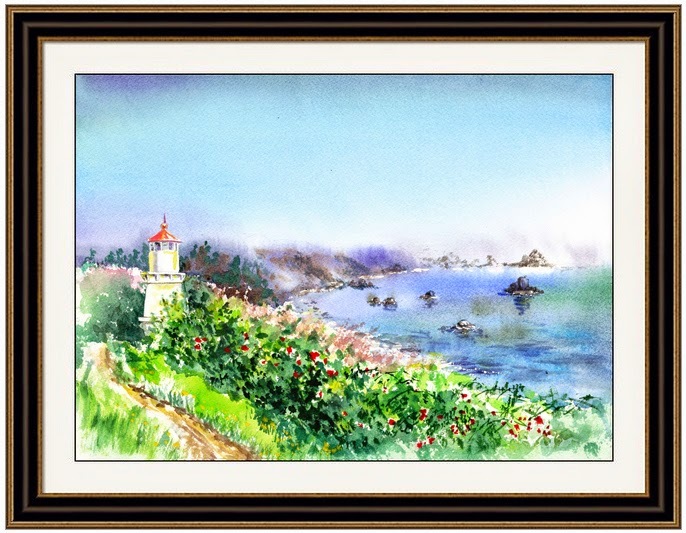 This Lighthouse is set in one of the most spectacular and peaceful surroundings on the northern California coast. The Point Arena tower is the only Pacific West coast lighthouse of significant height that you can climb to the top! Access to the lantern room provides a panoramic view of the rugged California coast and of the ocean. The first lighthouse at this site was constructed in 1870. The brick-and-mortar tower included ornate iron balcony supports and a large Keeper residence with enough space to house several families. In April 1906, a devastating earthquake struck the Light Station. The Keeper's residence and Lighthouse were damaged so severely that they had to be demolished. The new lighthouse began operation in 1908, nearly 18 months after the quake. It stands 115 feet (35 m) tall, and featured a 1st Order Fresnel Lens, over six feet in diameter and weighing more than six tons. The lens was made up of 666 hand-ground glass prisms all focused toward three sets of double bullseyes. It was these bullseyes that gave the Point Arena Lighthouse its unique "light signature" of two flashes every six seconds. This incredible optic, that held an appraised value of over $3.5 million, was set in solid brass framework, and was built in France. Prior to the introduction of electricity, the lens was rotated by a clockwork mechanism. The Keepers, or "wickies" as they were called, had to hand crank a 160-pound weight up the center shaft of the lighthouse every 75 minutes to keep the lens turning. Light was produced by a "Funks" hydraulic oil lamp, that needed to be refueled every four hours, and whose wicks would have to be trimmed regularly. Later, two 1,000 watt electric lamps were installed to replace the oil lamp, and a 1⁄8 horsepower electric motor was installed to replace the clockworks. Nowadays (since 1984) nonprofit organization called the Point Arena Lighthouse Keepers takes care of this place providing diligent historic preservation of this beautiful place. One of the stop during my recent art-trip was a small cozy town of Trinidad. I enjoyed walking along the rocky shore. Gentle breeze, afternoon Sun, and a lighthouse, all together called for some impressionistic style loose and fresh painting. 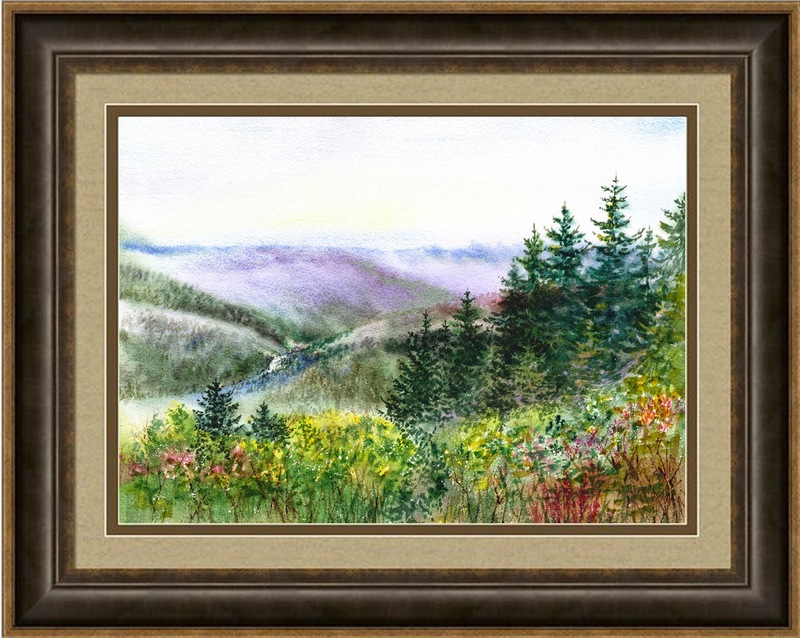 Trinidad is a seaside town in Humboldt County, located on the Pacific Ocean 8 miles north of the Arcata-Eureka Airport and 15 miles north of the college town of Arcata. Situated directly above its own natural harbor, Trinidad is one of California's smallest incorporated cities, (with a 2010 population of 367) and is noted for its spectacular coastline with ten public beaches and offshore rocks. These rocks are part of the California Coastal National Monument of which Trinidad is a Gateway City. This natural landmark is joined by three additional marine landmarks - the historic Trinidad Head Light, the Trinidad Memorial Lighthouse, and Humboldt State University's Fred Telonicher Marine Laboratory. For my painting, I've picked up this historical landmark. 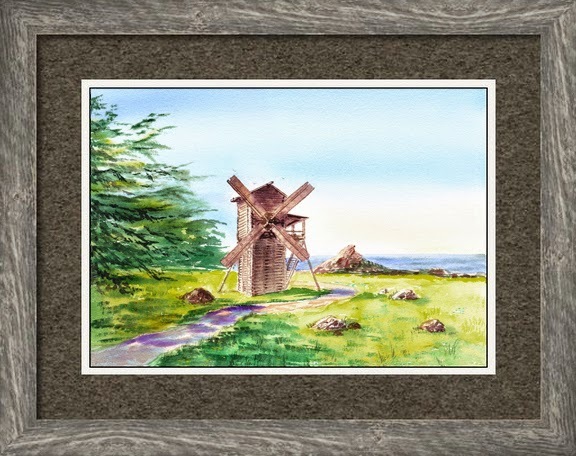 I liked the scene with Old Windmill against a blue sky and the ocean.